Josh Jones, Bevan Jones, Craig Carruthers and Adam Jarps took a fantastic 4th place in the UCI registered event missing out on a podium by only 20 seconds. We also had Josh Jones & Bevan Jones in action today. Josh broke away at the end of the first lap to catch a lone rider. Then another rider joined shortly after and working together they managed to stay away for the rest of the race. Josh came home 2nd and took 2x primes and gaining his cat 2 Licence in the process. Bev not been a quitter saw the race out till the end. His junior gears didnt help on the 40mph + decents. Chapeau gents a great day out. 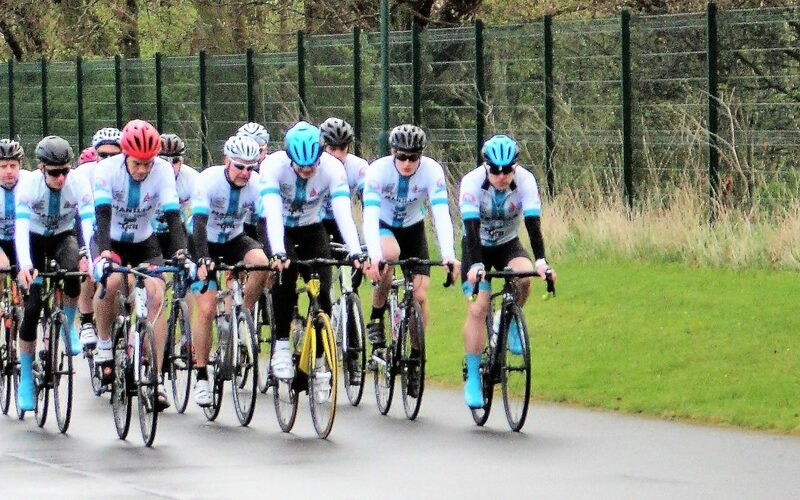 We had Scott Wilson & Josh Guest representing us in round 4 of the North Yorks Evening Road Race League around the Kirby Misperton circuit, the race was held in absolutely grim conditions that saw a neutralised start behind the car due to a torrential downpour 5 minutes before roll out. Josh stuck in well in his first road race but had to pull out part way through, Scott worked with the main group throughout performing exceptionally well eventually taking a well earned 6th place and a well needed hot shower! Fantastic performance from the guys in Cat 3/4 Race at Prissick Cycle Circuit. Scott Wilson Adam Jarps and Russell Wright representing the team. The pace was pretty comfortable but with a fairly strong headwind blowing down the start/finish line made it tough at times. Muckle Race Team were active pinging single riders off the front but not able to stick due to the wind. Scott, Adam and Russ rode towards the front for most of the race closing numerous attacks down. The inevitable bunch sprint ensued with Scott powering to the win and with Russ taking 3rd closely followed in 4th by Adam.